Each of the eight films is beautifully presented in its own board book. They are at least a couple of centimetres thick and 18 x 18cm square. On the left is the description of what the disc contains and on the right the discs themselves. 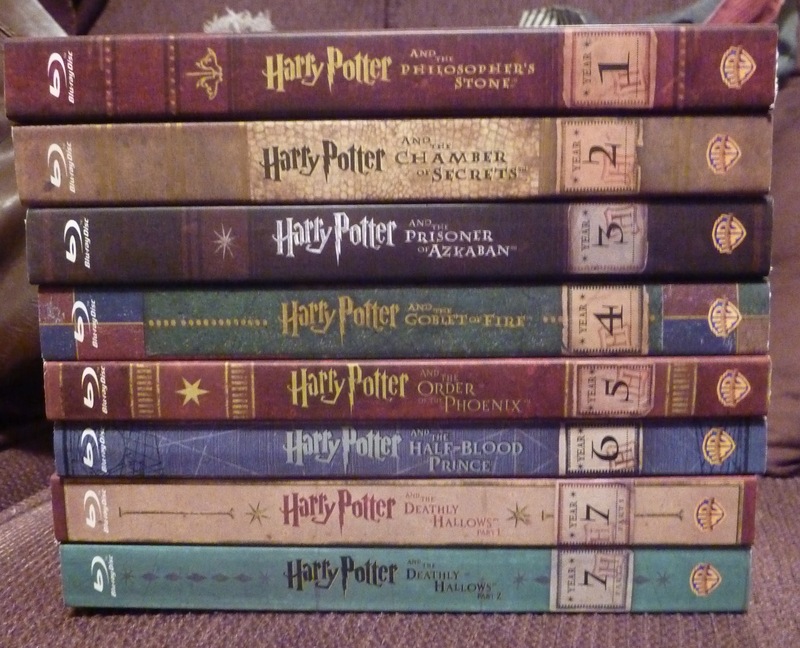 The first disc in each is the Blu-ray of the movie, then the DVD version, some have a DVD special features, then the Blu-ray extras disc with the Creating the World of Harry Potter documentaries, trailers, deleted scenes and more, and for the last two films 3D Blu-ray versions. The board book for the first film reflects the burgundy and gold colouring of the box. With gold stars/flowers. The title is in a circle. Year 1 is written on the bottom (and this numbering by years continues on each of the books). Inside the background is cream and the Blu-ray discs brown and burgundy and DVDs burgundy. The DVD is presented opposite a picture of the boats approaching Hogwarts castle. The DVD special features disc has two pictures opposite. Director Chris Columbus in front of Dan as Maggie Smith is lowering the sorting hat onto his head and Dan, Emma and Rupert with a clapperboard. The board book for the second film is cream and brown with the title in a rectangle along with an image of Slytherin’s statue from the Chamber of Secrets. The rest of the front resembles a nautical map and there are little ships on the front and back. Also a compass effect with W and E. The inside is a dark cream and the Blu-ray discs brown, DVDs cream, both with compass points centrally. The image opposite the DVD is of Hermione, Ron and Harry outside in the grounds of Hogwarts in their robes and Gryffindor scarves, they are looking back at something, Ron is carrying books and looks particularly worried. The two images opposite the DVD special features are on Harry and Filch stood in front of the ‘The chamber of secrets has been opened enemies of the heir…beware’ sign in blood and of Dobby clicking his fingers in the Dursley’s (post pudding incident). This third board book is black with HARRY POTTER written in red writing around the edges and a runic symbol, query like Sirius’ tattoos (Writing this I’ve just realised that the symbols on the bases of the drawers look like Sirius’ tattoos) with red writing such as dark skies, spells, fogging, werewolf etc. The title is in a semi circle within the symbol. 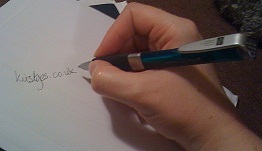 Outlining this symbol is silver writing with similar words – monsters, werewolf, ghost, relight etc. Again a creamy inner background with black discs with red (DVD) or silver (Blu-ray) writing. Opposite the Blu-ray is a picture of Harry flying on Buckbeak and opposite the DVD is an image of Harry sat up in his bed at Hogwarts holding his wand and the Marauders Map. Hedwig is perched on a chair next to the bed. The two images with the DVD special features disc are one of Sirius sat in his cell in Azkaban (I think) and Emma, Rupert and Dan in their jeans next to Alfonso Cuarón. The fourth book mimics the inner front of the box with the blue, green, red and yellow triangles (formed into diamonds) and dragons. The title is in a multicoloured diamond. Cream inner again with Blu-ray discs green with multicoloured edging and DVDs yellow with muliticoloured edging. The image opposite the DVD is of the Goblet of Fire with Dumbledore stood in front of it with rows of the student tables behind him. We see the Beauxbaton’ students on the left table and some of the other teachers in the back. Opposite the DVD special features is Hermione in her Yule Ball dress peering at the top of the staircase and Harry, Ron, Padma and Parvati Patel sat at their table at the Ball looking decidedly miserable. A browny book this time with gold runic symbols and the title in a polygon shape. Cream inside with red Blu-ray with a many sided star image and the DVD in brown. There is no DVD special features disc so only one image this time of Sirius and Harry crouched down in the battle at the Ministry, Sirius is holding his wand downward and pointing a finger. The sixth board book is my favourite because it replicates the Advanced Potions book from the Half-Blood Prince so it is blue with a black cauldron with silvery steam and silver and black scrawls. At the top is written Sectumpsempra For Enemies and just under this, Note: This book is the property of the Half Blood Prince. On the inside the details of the Blu-ray are in a cauldron outline. Both types of disc are Blue (DVDs lighter) with silver lines and, if you look carefully you can see the word Unicorn-horn. The image opposite the DVD is of Dumbledore in the foreground (arms behind his back) and Harry in the background at the top of the astronomy tower. There is no DVD special features disc. Part 1’s title is in a diamond shape with cream and small gold stars background. Each corner is burgundy with a small interlocking gold dragon symbol. The inside is cream again with a celtic type border. Blu-ray and Blu-ray extras dics are red with brown lines and DVD and 3D Blu-ray are cream with brown. Opposite the DVD is an image of Harry, Hermione and Ron having just disapparated from Bill and Fleur’s wedding and narrowly missed being squashed by traffic. Opposite the 3D Blu-ray is Dobby clicking his magic in Malfoy Manor (ah Dobby :o( – he’s a free elf). The Final book is light aqua green and the title is in a star type shape, there are lots of runic and leaf type drawings inside and outside of this shape. 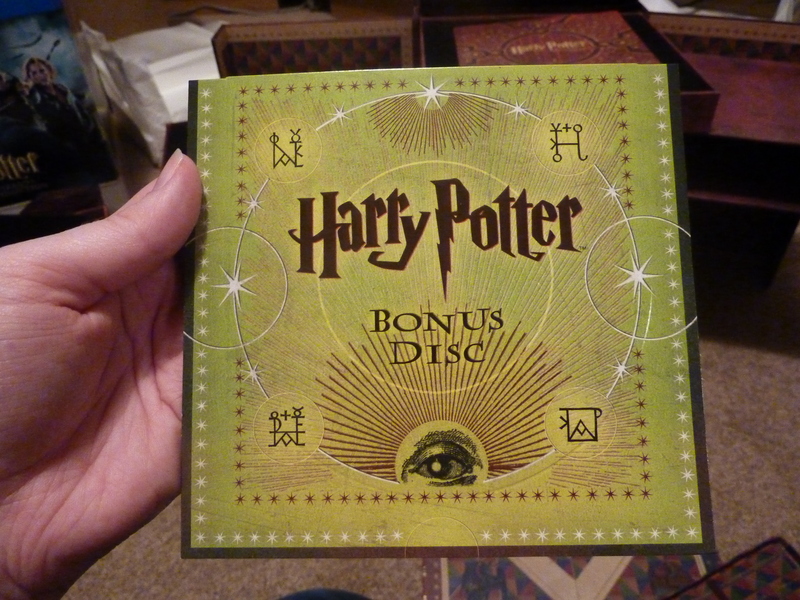 Although the inside is cream there is a thick dark border with runic symbols, the discs are green with the same symbol from the front, DVD and 3D Blu-ray a darker green than the other two discs. The image opposite the DVD is of Harry holding his wand, Hermione and Ron crouched down at the window to the boat house in Snape’s last moments. Opposite the 3D Blu-ray is Voldemort and his green wand sparks in the final battle. As noted before, this was just in a thin green cardboard cover with an eye on the front. Posted on September 14, 2012, in Kirsty rambles on about life, the universe, tv, and everything!, Reviews and tagged Blu-ray, Boardbooks, DVD, Harry Potter, The Wizard's Collection. Bookmark the permalink. 4 Comments. 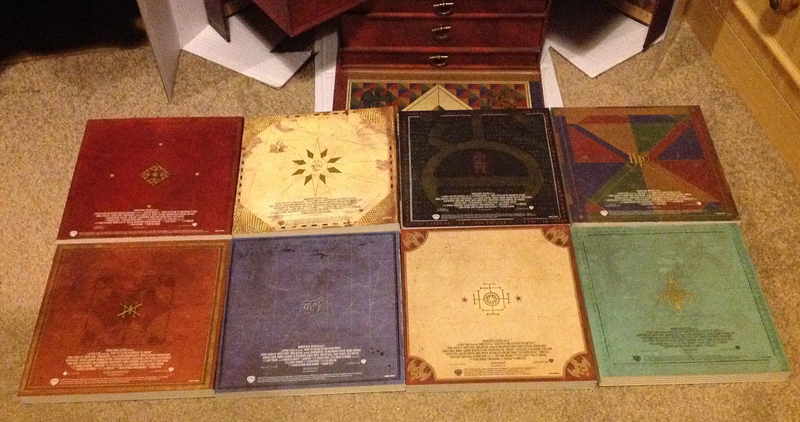 Those are awesome bluray covers! I wish you would have better pics of those dvd covers separately so I could print them out! Sorry, I’m sure someone somewhere will have done so.